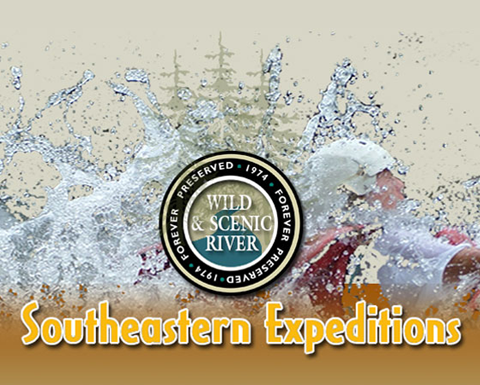 Southeastern Expeditions is looking forward to hosting your next whitewater adventure. Please review all the policies that are in place to ensure that your group has the best experience possible. If at any time you have questions or if you have difficulty deciding which trip to take, do not hesitate to call our reservations office at 1(800)868-7238. Call our office and check several dates and times for availability. Post a sign up sheet communicating available dates, price, and other pertinent information. Finalize number of people and make your reservation. Explain cancellation policy to your group and collect money. Send in deposit within two weeks of booking your trip. Arrange food, lodging, and transportation for your group. Get waiver forms signed and bring with you the day of your trip. Send in final payments at least 30 days before your trip. Check Maps and Directions and make sure to be on time. Watch the weather so you know how to dress! Bring your confirmation to outpost on the day of your trip. Re-read all information before calling and have a list of your group’s questions prepared. Have an alternate date in mind in case your preferred date is unavailable. The reservations will be in your name, so you will be the only one who can make changes to the reservation. Let us know if you need any suggestions for lodging, restaurants, campgrounds, etc. Please inform us of any disable/special needs persons who will be on your trip so we can properly accommodate them. Make sure all of your group members are aware of our cancellation policy. We accept Mastercard, Visa, American Express, personal checks, cashiers checks, and money orders. Everyone in your group who is rafting is of appropriate age for the section that they are rafting (Section III age limit is 10 and Section IV is 13). You have signed release forms for your entire group and anyone under 18 has a parent’s signature. 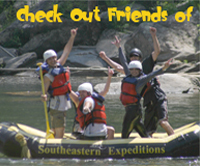 Everyone in your group knows they cannot bring anything with them in the raft-No coolers, towels, or bags. For anyone who has medications, let your Southeastern trip leader know and they will keep them for you in a special dry bag during your trip. Check your “what to bring and wear” sheet for appropriate clothing and what to bring if you’re camping. Remind everyone to wear shoes that have a heel strap or old tennis shoes on the river – No flip flops! Bring dry shoes for the ride home and a plastic bag is a good idea for wet clothes. We have hot showers and changing rooms for after the trip. Participants know that we have an outfitter store and also offer photos after your trip in case they want to bring some extra money for fun souvenirs. We reserve the right to cancel or move any trip during abnormal water or weather conditions. We also reserve the right to refuse passage to anyone judged impaired by the effects of alcohol or drugs. If we are forced to cancel your trip, we will issue a credit or refund up to the actual amount paid for your trip.